Blepharitis is a relatively common inflammatory condition which affects the eyelid margin (the edge of the eyelid). It can affect the eyelash roots (this is referred to as “anterior blepharitis”) and the area immediately behind this (this is referred to as “posterior blepharitis”). In “posterior blepharitis”, the tiny meibomian glands (glands responsible for the secretion of an oily substance that helps to prevent the layer of tears on the front of the eye from evaporating in between blinks) that lie within the eyelids may also be affected – this is referred to as “meibomianitis”. This causes a frothy discharge behind the eyelashes. In most patients, the cause is unknown. In “anterior blepharitis”, excessive bacterial activity may play a role. “Posterior blepharitis” is more commonly seen among patients with skin conditions such as seborrhoeic dermatitis (which is associated with “dandruff”) and rosacea (which causes a redness of the skin of the cheeks and nose). This occurs because, without adequate oily secretions in the tear film on the surface of the eye, the tear film quickly evaporates. This is typically worse outside in the wind or in an air-conditioned environment. One of the aims of treatment is therefore the improvement of both the quality and quantity of the oily meibomian gland secretions (see below). An irregular tear film (due to failure of the oily meibomian secretions) can lead to localised areas of dryness on the surface of the eye. This can stimulate the excessive production the watery component of the tears, with patients sometimes describing a very uncomfortable ‘streaming’ of the eyes. In the absence of the correct proportions of mucus, watery and oily components of the tears, excessive watering does not adequately lubricate the surface of the eye (the cornea), and further cycles of excessive watering can occur as a reflex. With blockages of the ducts which conduct the oils within the meibomian glands to the surface of the eye (this is more likely to occur in colder climates), the gland can burst inciting a local inflammatory reaction to the exposed oils. Inaccurately termed ‘cysts’, these swellings are in fact localised inflammatory reactions to collection(s) of oil within the eyelid. Acutely, the ‘cyst’ can become inflamed or even infected, and over a few weeks the inflammation either settles completely or leaves a residual lump within the eyelid (a “chalazion” or “meibomian” cyst). These changes can occur in long-standing disease, but they can also occur in other eyelid disorders, and for this reason an ophthalmic opinion should be sought. No. The disorder tends to wax and wane and in most patients does not tend to last – in its most severe form – for more than a few months. Blepharitis tends to be worse in cold windy weather, air-conditioned environments, prolonged computer usage, sleep deprivation, contact lens wear, and with general dehydration. It also tends to be worse in the presence of active skin disease e.g. acne rosacea, seborrhoeic dermatitis. Blepharitis is a clinical diagnosis, although in severe cases, particularly if only one eyelid appears to be affected and if the diagnosis is in doubt, a surgical biopsy may be required to exclude the presence of a tumour which very rarely can mimic blepharitis. Strict hygiene of the eyelids is the mainstay of treatment and should be undertaken in the morning and evening for the first 2-3 weeks and then at least once every day indefinitely to keep the inflammation under control. The EyeBag™ is a much more convenient and effective method of heat application because it provides sustained warmth for 5-10minutes (www.eyebagcompany.com). Massage the eyelids with your forefinger straight after applying the warmth. Massaging helps to force out the oily fluid from the meibomian glands which then helps to stabilise the tear film on the surface of the eye. Massage the upper eyelid and the lower eyelid gently towards the eye. This action should be repeated 5 to 10 times over about 30 seconds immediately following the application of heat. Massaging should neither to be too gentle nor too firm. It should be relatively comfortable and you should not press hard enough to actually hurt your eye under the closed eyelids. After heat application and massage, clean the eyelids. Blephaclean® wipes twice daily for 1 or 2 weeks are an excellent way to achieve rapid control of blepharitis. (These wipes are particularly useful in removing eye make-up, avoiding irritation/allergy associated with other eye make-up removers). Blephasol® solution on a cotton bud once daily can then be used as daily maintenance to keep the eyelid margins clean. 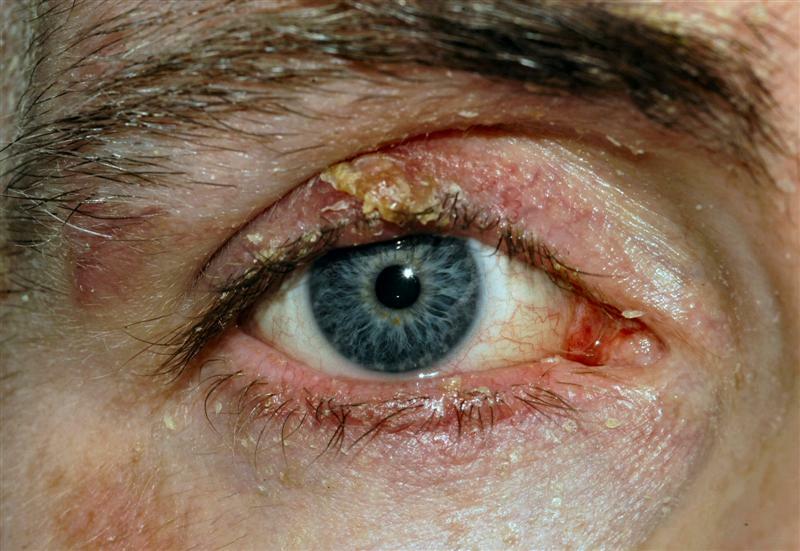 Ointments/drops containing steroids should not be used unless prescribed by an ophthalmologist. Since blepharitis causes tears to be abnormal, artificial tears can give relief from irritation, even when your eyes are watering (eyes can water as a reflex reaction to a basic dry eye problem or tear film abnormality). These should be used at least 4 times a day at least to prevent symptoms rather than to just relieve symptoms. There is a large variety of artificial tear preparations to choose from. It is essential to use preservative free drops. Preservative free: Hyabak drops, Hylotears, Hylotears Forte, Systane drops preservative free, Viscotears preservative free, Celluvisc or Liquifilm tears preservative free.